The main Joetsu Shinkansen (‘bullet train’) line connects central Tokyo (with stops at Tokyo Station and Ueno Station) with Niigata City, stopping at Jomo Kogen Station in Minakami on the way north. Jomo Kogen is a Shinkansen-only station and located 10km or so to the south of the main central Minamaki town area. The Joetsu-sen local line also goes through the Minakami, connecting Takasaki City to the south of Minamaki with the Nagaoka City area of Niigata Prefecture. This line has a number of small local stations including Kamimoku Station, Minakami Station, Yubiso Station and Doai Station before continiung on north into neighbouring Yuzawa in Niigata Prefecture. This journey is around 59km and usually takes around 65 minutes. about 11km about 8km A free resort shuttle bus is available from Jomo Kogen Station (reservation required) and Minakami Station. About 20 minutes from both. ホワイトバレー about 14km about 3.5km Shuttle buses are available from Minakami Station (3km, about 10 minutes). 20 minutes by taxi from Jomo Kogen Station. 1.5km from Yubiso Station Taxi from Minakami Station (3km) or Yubiso Station (1.5km), or local buses. No resort shuttle bus is available. 奥利根スノーパーク about 17km about 6km 40 minutes from Jomo Kogen Station by bus. 1.5km from Doai Station A local bus service from Jomo Kogen Station takes 50 minutes; from Minakami Station takes 25 minutes. Bus stops at the Tanigawadake Ropeway Station (resort base). 赤沢 about 21.5km about 25km There is no direct bus to the resort, but a few buses go from Jomo Kogen station to Sarugakyo Onsen (30 minutes) and then to Houshi Onsen (15 minutes). 水上宝台樹 about 26km about 15km A local bus service is available from Jomo Kogen Station (70 minutes) and Minakami Station (45 minutes). Buses stops at Takagawa Iriguchi - a resort shuttle bus is available from there to the resort base. 水上高原藤原 about 27km about 16km A free bus service is available from Minakami Station. Reservations required. 水上高原スキーリゾート about 28.5km about 18km A free resort shuttle bus is available from Jomo Kogen Station (about 60 minutes) and Minakami Station. Reservations required. Shuttle bus information for the 2015-2016 season will be checked and updated here by December 2015. Joetsu Shinkansen from Jomo Kogen to Echigo Yuzawa Station (13 mins). Joetsu-sen from Minakami Station to Echigo Yuzawa Station (35 mins). Joetsu-sen from Minakami Station to Numata Station. Kawaba is about 21km from Numata Station. 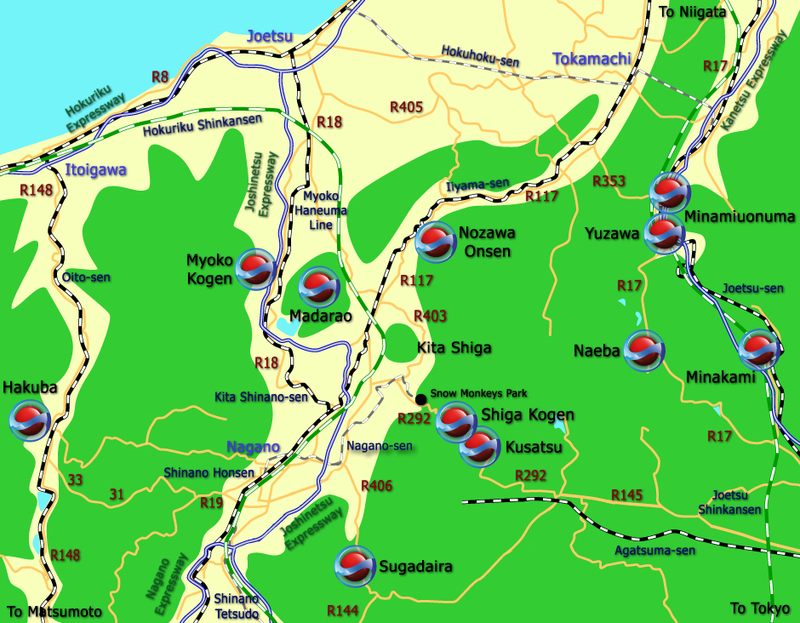 See Katashina Travel guide for more details. Central Katashina is about 35km from Numata Station. Joetsu-sen from Minakami Station to Shibukawa Station. Agatsuma-sen from Shibukawa Station to Naganohara Kusatsuguchi Station. Kusatsu resort is about 14km from Naganohara Kusatsuguchi Station. Joetsu-sen from Minakami Station to Takasaki Station (or Joetsu Shinkansen from Jomo Kogen Station). Joetsu Shinkansen from Takasaki Station to Iiyama Station. On-board time about 2 hours. 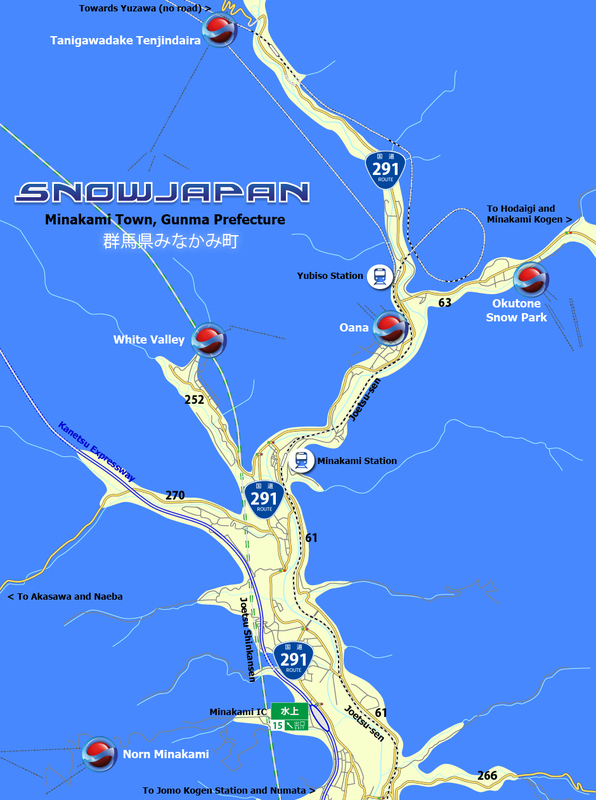 For detailed information on how to get to Minakami by car, please go to this section.